IT’S OFFICIAL — I’M DGA! 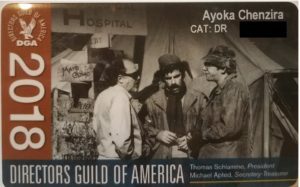 Frankly, I never thought that I would become a member of the Directors Guild of America (DGA), but it’s now official, and I am grinning from ear to ear. Queen Sugar kissed and signed in to the guild by my Sisters in Cinema Ava DuVernay, Neema Barnette and Julie Dash, I am in fabulous company and couldn’t be happier.